Lancing Football Club manager John Sharman will step down from his position following the final game of the season. Sharman, who took charge 18 months ago, will have guided Lancers to successive mid-table finishes in the Southern Combination League Premier Division. 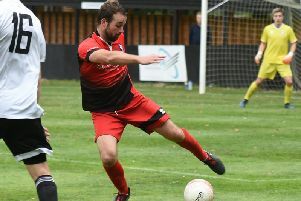 After taking over from Ash Bailey back in October 2016, Sharman's side ended last season 12th, while they will go one better in his first - and only - full season at Culver Road with an 11th-placed finish at least guaranteed ahead of Lancing's final game of the season at rivals Worthing United on Saturday. Lancers manager Sharman admits it's not a decision he has made lightly and said: "I originally took over from Ash Bailey when I think we were third or fourth from bottom in the league and the priority was survival, which in the end we achieved comfortably. Again this season we've achieved a mid-table finish and, considering we don't pay the players a single penny, that's like finishing in the top-six. This season it was a great achievement for the players and the club to be awarded team of the month for two consecutive months, which I believe has not happened before at Lancing. "We have a really young under-21 side and no reserve team, so the first team squad is quite small. We went through a poor patch of results when we had numerous players missing through injuries, suspensions and unavailability, otherwise we may well have finished slightly higher. "They're a great group of lads who have given everything. I've told the players that they should be looking to push on and win things, as should the club. "I have to thank Malcolm Saunders, Nigel Geary, Georgie Hill, Tony Wheels and Darren James for all their help as well as the committee and supporters, who have always been behind us. "I have a long affiliation with the club and this experience has been a pleasure so it's a sad day for me but at this moment in time I believe I've taken the club as far as I can. "It's time for me to step aside and let someone else take up the challenge and hopefully take the club forward. I leave on good terms and as for managing Lancing again in the future, never say never." Lancers secretary John Rea paid tribute to the departing Sharman. He said: “John has done a brilliant job stabilising the club and bringing through some very good young players. would be nice if he could continue that in another role with us. apply should do so by email with a CV to rea.john@mail.com by no later May, 5.